Welcome Rosemary Lee Dental Hygienist! We are delighted to introduce our new dental hygienist Rosemary Lee! Rosemary began working as a dental assistant at the McCarl Dental Group in Greenbelt, MD when she was sixteen. Rosemary always enjoyed helping people and discovered a passion for dentistry. Rosemary attended the University of Maryland, College Park where she graduated in 2012 with a Bachelor of Arts in American Studies. In the spring of 2016 Rosemary earned an additional Associate’s Degree in Applied Science from Howard Community College’s Dental Hygiene Program. Rosemary was the recipient of the Hu-Friedy Golden Scaler award that recognizes excellence in patient care and is given to the most outstanding dental hygiene student. 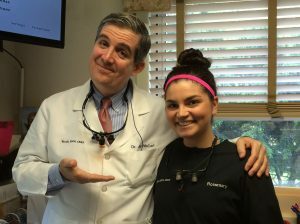 The dentists at McCarl Dental Group are impressed with Rosemary’s natural talent, dedication and attention to detail. In her spare time Rosemary enjoys working and spending time with her family, traveling and cheering on the Terps! Comments Off on Welcome Rosemary Lee Dental Hygienist!